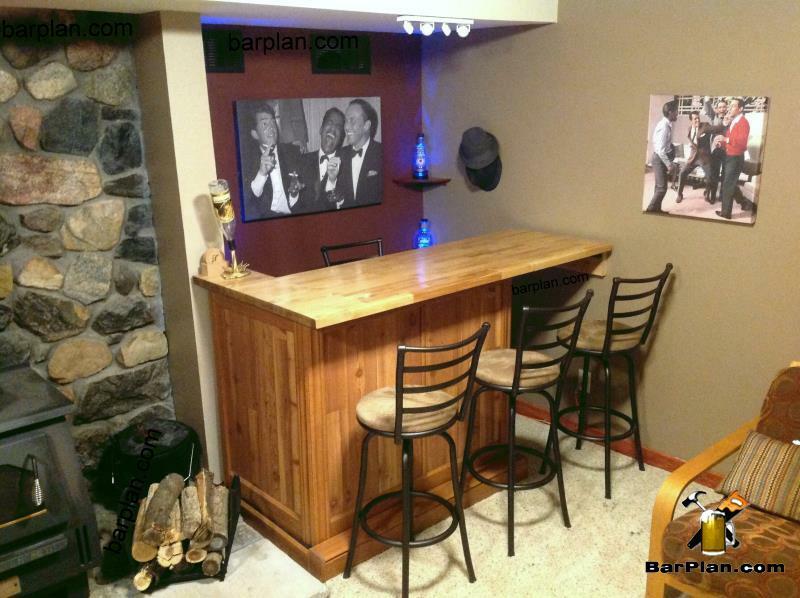 Here is an awesome “Tiny Bar” project recently posted by site member Tony M.
Most support requests are for builder’s wanting to make their bar projects larger. It’s a familiar problem. 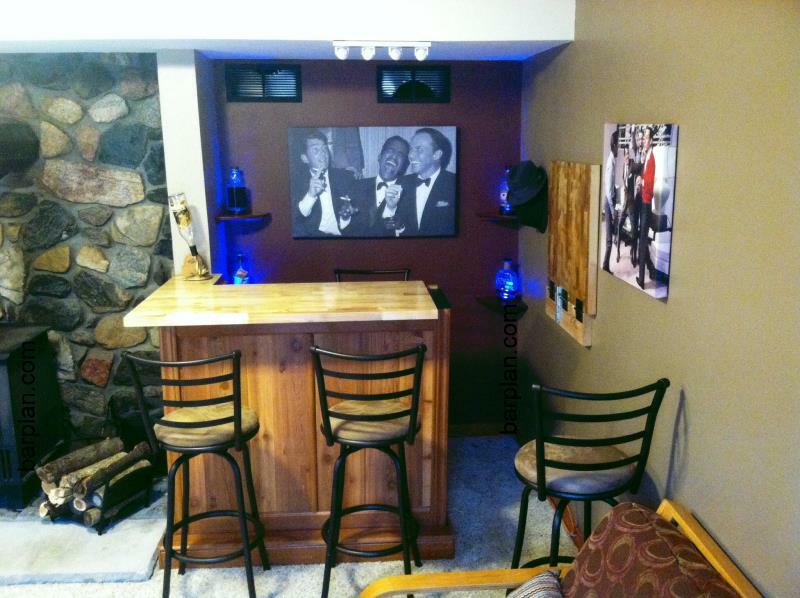 Tony M. did the opposite and as a result, he created a very nice, intimate bar space. He uses a unique corner space that might otherwise be neglected. The CHBD can be used to trim the length down to about four or five feet long. This is not Tony’s first bar project. 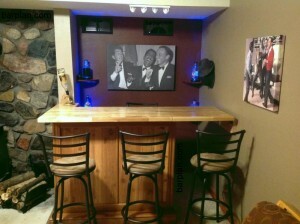 As a site member years before, he had built another bar in his earlier home. He built the previous bar using the EHBP-04 which is far from tiny. Unfortunately for Tony and fortunately for the new owners, that bar stayed with the home. 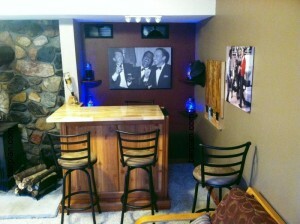 The new tiny bar fills in a nice corner space along his fireplace. The base framing appears to be a modified EHBP-01 basic bar design. That particular plan set can be easily modified in length and width to fit your space, like Tony did here. The custom project features a “flip- up” style flapper door. We cover that topic in the miscellaneous plan sets. The lift gate door consists of the top panel, a few hinges of your choice and a latch pin to hold it up. Because Tony chose to do a flip-down style flapper door, the top is much easier to make flush when closed. The classic decor is awesome. Wall color choice is earthy and warm. The rat pack photo with Dean, Sammy and Frank is always a bar room favorite. Here’s another favorite rat pack poster for your bar from Amazon. Tony’s adaptation of the plans just goes to show how many variations can be accomplished. It’s a simple enough project, but with a little added ideas from the plans, the end result turned out great. What a great little home bar. Cozy too! Wow, thank you for featuring my bar…how cool! One small correction, this small bar is actually in my new house and my other bar based on the EHBP04 L-Shaped was in my last home. Thanks, this made my day!